Previous analyses of the hominins from Sima de los Huesos in 2013 showed that their maternally inherited mitochondrial DNA was distantly related to Denisovans, extinct relatives of Neandertals in Asia. This was unexpected since their skeletal remains carry Neandertal-derived features. Researchers of the Max Planck Institute for Evolutionary Anthropology in Leipzig, Germany, have since worked on sequencing nuclear DNA from fossils from the cave, a challenging task as the extremely old DNA is degraded to very short fragments. 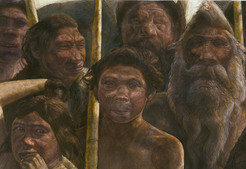 The results now show that the Sima de los Huesos hominins were indeed early Neandertals. Neandertals may have acquired different mitochondrial genomes later, perhaps as the result of gene flow from Africa. Until now it has been unclear how the 28 400,000-year-old individuals found at the Sima de los Huesos (“pit of bones”) site in Northern Spain were related to Neandertals and Denisovans who lived until about 40,000 years ago. A previous report based on analyses of mitochondrial DNA from one of the specimens suggested a distant relationship to Denisovans, which is in contrast to other archaeological evidence, including morphological features that the Sima de los Huesos hominins shared with Neandertals. “Sima de los Huesos is currently the only non-permafrost site that allow us to study DNA sequences from the Middle Pleistocene, the time period preceding 125,000 years ago”, says Matthias Meyer of the Max Planck Institute for Evolutionary Anthropology, lead author of an article that was published in Nature today. “The recovery of a small part of the nuclear genome from the Sima de los Huesos hominins is not just the result of our continuous efforts in pushing for more sensitive sample isolation and genome sequencing technologies”, Meyer adds. “This work would have been much more difficult without the special care that was taken during excavation”.